With more than 30,000 square feet of space, Oasis Conference Center is always the site of choice for meeting and event planners. Conveniently located in Northeast Cincinnati, Oasis Conference Center always offers free parking. Movable air walls and the option of adding plenty of natural light enhance our ability to meet your every need. We've even installed doorways that can be removed in our ballroom to make moving in a snap. It's all with the sole objective of making it easy for you to create an unforgettable event that's as flawless as it is effective. Whether you're hosting 20 or 2,000, Oasis Conference Center offers an unbeatable combination of spectacular surroundings, incredible service and abundant, flexible space. No one offers you more adaptable meeting and conference space than Oasis Conference Center. Our unique facilities can be transformed to fit your every need, whether you're hosting an intimate executive retreat, an important teleconference or a massive industry trade show. From an outdoor patio with sweeping golf course views, to an intimate boardroom, a bright and airy pre-function atrium or an expansive ballroom, we offer an array of options for your event. 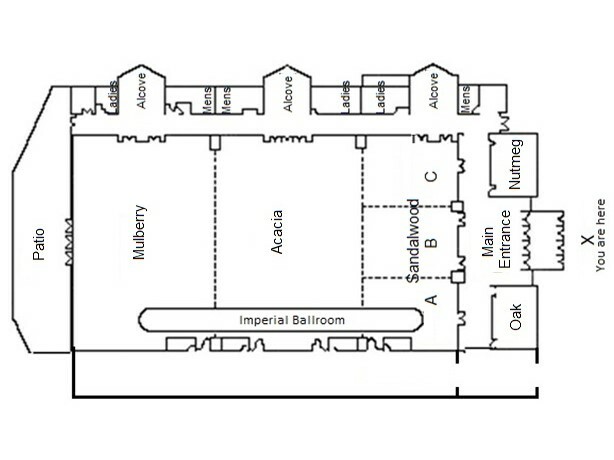 Ceiling Height: Imperial Ballroom Ceiling Center = 20'; Perimeter = 18'. Ceilings in Oak and Nutmeg Rooms = 10'.